Form DS-64 is one of the few forms issued by the US Department of State that can be completed online. This is because though the form allows a passport holder to report a lost or stolen passport and start the process to replace the document, it is not actually enough to replace a passport; for that, Form DS-11 is required. If you’re in the US and not planning on traveling anytime soon, then Form DS-64 is a useful way to invalidate any US passport in the event it was stolen from your home or lost in transit. No appointment is required with a regional passport office until you have international travel plans set and are ready to get a new passport book – if you’re not planning on traveling for months or years, it would be more beneficial for you to wait to apply, to maximize the life of your new passport. However, if you’re currently outside the US and discover your passport has been lost or stolen – usually as a result of a thief swiping a bag rather than specifically targeting a passport – there is a procedure to follow. First, you should report the theft to the police station closest to where it occurred and obtain a copy of the report. Next, find the US embassy or consulate and bring this report, along with any other form of ID you may have, and Form DS-64. If you’re not close to any US embassy or consulate, the loss can be reported over the phone, but you’ll still need to visit one to get a new travel document to continue your trip or return home (for long-term expats, this may not be necessary for some time). In this case, Form DS-64 can be presented with another form of ID, a passport photo, the police report, and your travel plans to receive an emergency passport good for a few days to repatriate yourself. However, if you have enough time in the country and the theft was not significant enough to cause you to alter your plans, you can invalidate the old passport with Form DS-64 and apply for a new book with Form DS-11; the US State Department can even waive the fee until you return to the US in some cases. What information do you need for Form DS-64? Many travelers carry a photocopy – digital ones can be lost if your phone or laptop is also stolen – of their current passport. This information comes in handy when it comes time to use Form DS-64. In addition to basic information like your name, social security number, birthdate, and address, the US Department of State requires you list your lost or stolen passport’s number and issue date. Details of the loss or theft must also be included, and whether you intend to apply for a new passport book or card immediately. Assuming you don’t have enough time in the country and require an emergency passport or you’re in the US when your passport is lost or stolen, the replacement process starts with Form DS-64, and ends with Form DS-11. 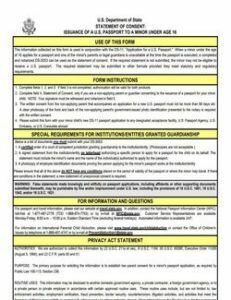 As long as you check the box on DS-64 stating that you will be submitting the form in connection with the application for a new passport book or card, the Department of State will be prepared for your request. As with first-time passport applicants, those who have lost their passport or had it stolen will receive a new ten-year book or card for adults, and a five-year book or card for any applicant under 16 years old. There are no additional fees for lost or stolen passports, just the standard $110 processing fee for adults, $80 for children.